UP Volunteers for Children brings you this superhero-themed afternoon of fun with the kids of Meritxell Children’s World Foundation, Inc. and Manila Boystown Complex. 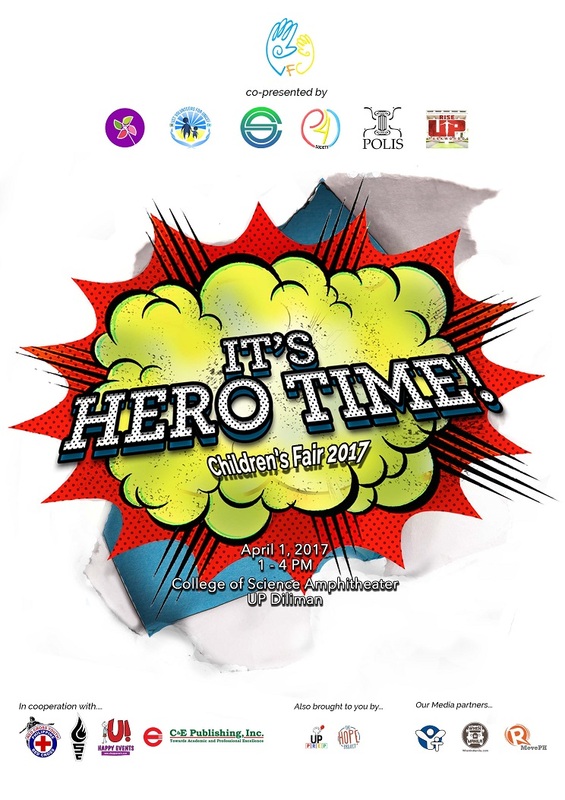 The UP Volunteers for Children (UP VFC) will launch its biannual Children’s Fair with the theme “It’s Hero Time!”, an event organized for the children of a chosen beneficiary to get to play, learn and relish in the simple excitement of being kids. Now on its eighth year, Children’s Fair 2017 will once again be a worthwhile venture for student volunteers to give and receive happiness by providing games and educational activities for the children. This semester’s Children’s Fair will commence at 1 pm – 4 pm on April 1, 2017 at the College of Science Amphitheater, UP Diliman. Student volunteers from UP VFC and partner organizations will get to spend an afternoon with the kids of the Meritxell Children’s World Foundation, Inc. and the Manila Boystown Complex. Several booths around the venue will be set up with fun activities where the children can sing, draw and color, learn first aid, or share a snack after a tiring afternoon. “Children’s Fair always provides a happy and positive environment for both the kids and the volunteers. It gives them hope that the world is kind, through this community that helps and cares for one another,” Chanda Ching, overall head for Children’s Fair 2017, said. If you want to donate or participate in Children’s Fair 2017, email us at childrensfair.upvfc@gmail.com or contact Peter at 09052485796. The University of the Philippines Volunteers for Children (UP VFC) is a nonprofit, university-based, and student–led organization that aims to educate the Filipino children, uphold and protect their rights, and improve their welfare by raising funds and conducting programs and projects for their communities. In keeping up with the tradition of creating service-oriented and socially-aware individuals, we empower students by engaging them in volunteer work to fulfill our vision of a society with secure and healthy Filipino children. To learn more about Children’s Fair and UP VFC, visit us at www.facebook.com/ChildrensFair.UPVFC or www.facebook.com/UPVolunteersforChildren.